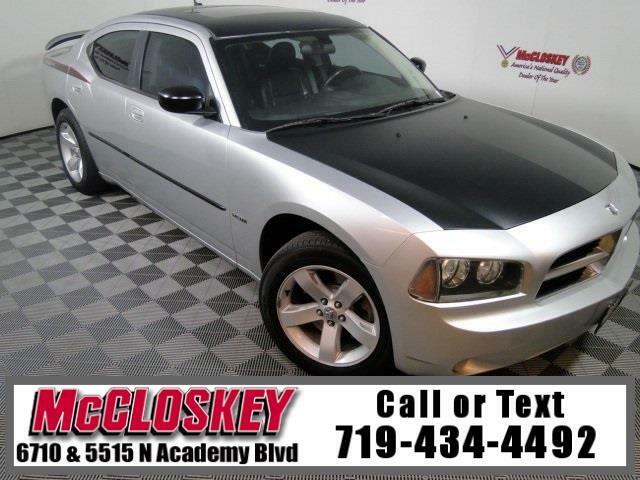 Sporty 2008 Dodge Charger R/T with All Wheel Drive Power Moon Roof, Heated Leather Seats, Keyless Entry, HEMI 5.7L V8 Engine, and Premium Sound System! The Charger R/T is similarly equipped to the SXT, but adds V8 power with dual exhaust, an enhanced Auto Stick transmission and heated folding mirrors. The R/T's 5.7-liter V8 delivers 340 hp and 390 lb-ft of torque. With an abundance of torque and rear-drive power reaching the asphalt, the V8-powered 2008 Dodge Charger R/T delivers grins and giggles in equal measure for enthusiasts who appreciate driving as well as the extra utility of its four-door sedan body style. This vehicle passed our 110 multi-point inspection and is backed by our National Quality Dealer of the Year Award. We are an ''A+'' Better Business Bureau Rated Business. We offer low interest rate financing, low down payments and the highest trade allowances in the state! Here at McCloskey we do things a bit differently, we shop our competition every day to ensure a great value to you. Come on down and experience it for yourself. This McCloskey Assured vehicle includes a 2 month/2000 mile Warranty and a Vehicle History Report!! At McCloskey we strive to provide ASSURANCE, TRUST, VALUE AND QUALITY! Call 719-434-4492.